As I sat outside yesterday in shorts and bare feet, it felt as if summer was here to stay. But that’s how it feels every spring in Western New York, and every year our spring weather takes us on a roller coaster ride. The high was in the 70s yesterday, yet you know we’re still going to get freezing temperatures before summer really arrives. Some years we’ve had flakes of snow flying around in the air in May. I know you want to rush into your garden, and while there are some things you can do now, there are also a few things you shouldn’t do yet. Here are 17 reminders for your early spring garden. This is the first thing you should do before you do anything else in your yard. You can’t dig in wet soil. You shouldn’t even walk around on top of wet soil. We’re not worried about you getting muddy; we’re worried about you compacting the soil. 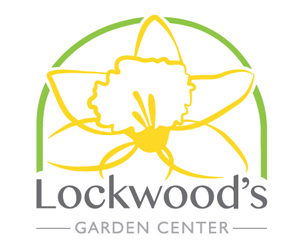 When the soil is compacted, it won’t drain well, said Teresa Buchanan, general manager at Lockwood’s Greenhouses, 4484 Clark St., Hamburg. Plus, compacted soil makes it more difficult for roots to penetrate. Walking around in your garden can cause compaction, so if your yard is still wet and you want to pull weeds, try to stay on the sidewalk or on pathways. Don’t dig if your garden is too wet. How do you know if it’s too wet? Scoop up some soil and squeeze it in your hand, Buchanan said. If it forms a glob, it’s too wet and you can’t work it. If it’s crumbly, you can work it. Pick up sticks. Throw out any litter that blew into your yard. Rake those leaves you couldn’t get to in the fall. If you left your ornamental grasses and seed heads of plants such as black-eyed Susans in place for winter interest, go ahead and cut them down now. This flower is so pretty, when I saw some in my neighbor’s lawn, I almost transplanted it into my garden. It turns out that lesser celandine is a highly invasive plant that’s bad for your lawn and bad for the environment. Dig it up and get rid of it as soon as you notice it. Get more details here. I planted sage in a container last summer. In the fall, I piled lots of dead leaves around the container and on top of the plant and it came through our brutally cold winter just fine. 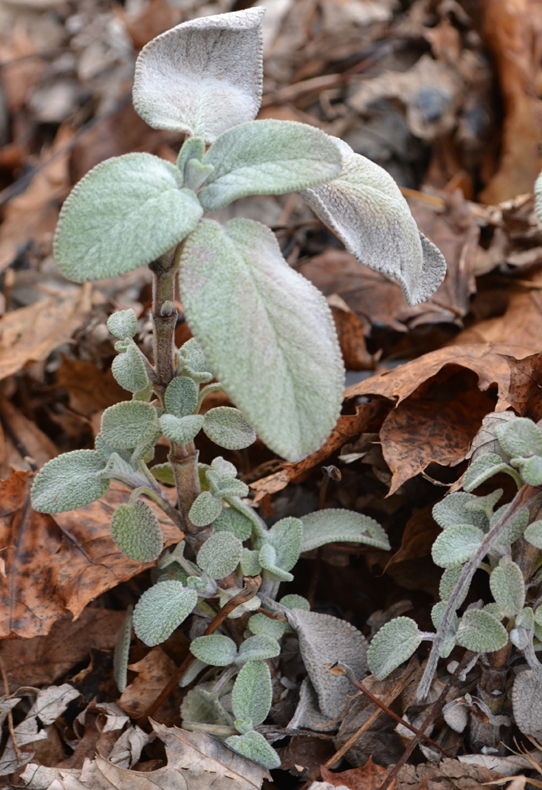 The sage does have a few dead or damaged leaves, but most are fine. The plant is sprouting quite a few new leaves as well. My chives are growing, too. They’re still short, but there’s no reason I couldn’t harvest some. I have so many plants, it’s not as if I’ll run out. Tip: If you’re a new gardener and want an easy-to-grow edible plant, try chives. They reseed easily and will spread. You can buy chives now at Goodman’s Farm Market, 2227 Cayuga Dr. Ext., Niagara Falls, NY. They also have parsley, which can stand a hard frost, and cilantro, which can take some light frost. They have basil, but keep that inside until the danger of frost has passed. Now is a great time to plant lettuce and spinach from seed because they like cooler temperatures. If you don’t want to start the plants from seed, you can buy lettuce, kale, Swiss chard and bunching onion plants now at Mischler’s Florist and Greenhouses, 118 South Forest Rd., Williamsville. If your ground is still too wet, create a “salad bowl garden” by planting them in a container. Other cool-weather vegetables include peas, broccoli, cabbage, cauliflower and Brussels sprouts. Get more details on growing cool-weather vegetables. Pansies are now available at Mischler’s. Look for more frost-tolerant flowers to stretch the gardening season. You can’t plant tender plants outside until the danger of frost has passed, and in Western New York, that’s generally Memorial Day weekend. That’s seven weeks away. The instructions on most seed packets will tell you to start the seeds inside six to eight weeks before you want to plant them outside, so this is the perfect time to start seeds indoors. You can get seeds, trays and potting mix at Goodman’s Farm Market, 2227 Cayuga Dr. Ext., Niagara Falls, NY. Hummingbirds will be arriving soon in Western New York. Get your feeder up now so it’s waiting for them when they arrive. To fill your feeder, don’t use commercial mixes, red food coloring or any other additive. Get more details here. If you took your rain barrels inside for the winter so that the water wouldn’t freeze and split your barrel, you can bring them out now. They not only give you a convenient source of water, rain barrels help keep our waterways from getting polluted. 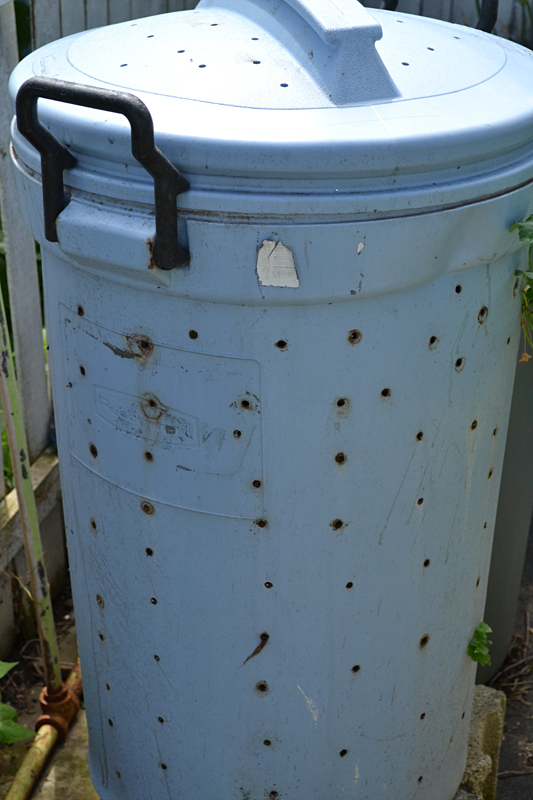 Rain barrels hold rain water where it falls so it doesn’t overwhelm our combined storm-sewage system. When there’s a heavy rainfall, the excess rain-sewage water get dumped, untreated, into the lake and river. That’s why beaches are often closed after heavy rain– the water is contaminated with sewage. Consider planting a rain garden, which is another way to hold rain water in place. Now is the time to do pruning on most plants. You want to prune before the plants leaf out. Otherwise, the plant has wasted a lot of energy creating those leaves that you later cut off. 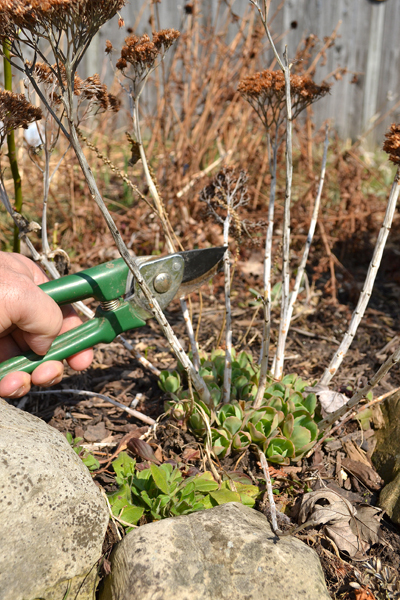 Since now is the time to prune, now is the time to sharpen your tools. Lockwood’s offers a tool sharpening service. Drop off your tools and they will call you when the tools are ready to be picked up. 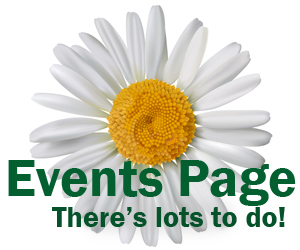 Click here for a list of prices and services. If you have bare spots in your lawn, now is a good time to plant grass seed, said said Ray Crawley, manager at Goodman’s Farm Market. It will get a good start before the weather turns hot and dry. Grass seed takes a lot of watering, and the spring weather will do some of that watering for you. One way to make your garden look more attractive is to mulch around plants. “For a minimal amount of effort and investment, mulch really dresses up your garden and makes it look nice,” Crawley said. Don’t mulch until all of your perennials have all popped out of the ground or you may be covering up one of your plants. Goodman’s carries natural, black, brown and red cedar as well as hemlock mulch. They also carry top soil and cow manure. As you plan your garden, think about permaculture, which is including food trees and shrubs in your yard. To help sort through not just fruit and nut trees, but all sorts of woody plants, use the database from Cornell will help you find trees and shrubs that are best suited for your yard. Consider using native plants. Get inspiration from garden walks. Learn about lasagna gardening and how to prepare a perennial bed without digging. For vegetable gardens, consider warming the soil with black plastic. Before you dig, call 811 or use the onlineSingle Address Ticket. The utility companies will come out and flag where their lines are so you don’t hit them. It’s a free service. Find out more. Compost is so good for your garden, and you can make it for free from what would have been garbage! It’s easy to do. Learn more about composting. Yes, you want to get outside and work in your garden, but if it’s too wet to dig, just pull out a lawn chair and enjoy the sunshine! We’ve waited all winter for this moment. It’s so exciting. Good advice and tips Connie. thank you Connie. It is so tempting to just get out there and start planting. I am starting some seeds inside. I found some great tomato plants on sale and I am keeping them in my plastic greenhouse, feeding them up , until they get planted outside. Anyone interested n growing giant pumpkins? I found a place on line called “giant seeds.com” . I have been very successful with their seeds but they are expensive. I always start them very early. Can you believe this? My potted geraniums (pelargoniums) survived this cruel winter in that plastic greenhouse. It was great meeting you at the garden show. I am still chasing the fungal resistant Impatiens sp. Julie Ann, it was nice meeting you, too. We are all waiting for an impatiens that is resistant to downy mildew. Best of luck! Linda, it’s been a long, cold winter, so we really want to get into our gardens now. But hey– Don’t we say that every year? It definitely is exciting to get some sunshine and warm temperatures. Dianna, I so sorry for not responding more quickly. I checked and found out that you can move shrubs as long as the soil is dry enough. I hope that helps.